SOHOLogics has a primary and secondary focus for each customer. Our primary focus is directed at customer satisfaction. This is the key to every relationship we establish with each customer. We guarantee that each customer receives professional service, integrity, ethical decisions and a positive attitude from each SOHOLogics associate. SOHOLogics, however, does not stop there to ensure customer satisfaction. We also provide technical services, upgrades, training and support to ensure product quality. To further this goal in the future, we are planning to release an online customer service tag system which will enable customers to find information, updates and support for the products and service they purchase. Our second focus is directed at saving the customer money while providing solutions that achieve productive, efficient results that makes sense for each customer. The results of sensible solutions will generate profitable returns for each customer. SOHOLogics takes a look at each possible solution for the customer and provides information on the positives and negatives of each and every alternative, which will allow each customer to make an informed decision. We even get quotes from other companies often to show a customer how much money they save through their partnership with our company. Jennifer Madden joined the brain trust of elite individuals in May of 2007. She has represented the glue that has tied all of SOHOLogics’ expertise together giving the company a completely new direction and energy. Jennifer has brought a new edge to the SOHOLogics team. An edge that Jason and Andrew could have never envisioned. 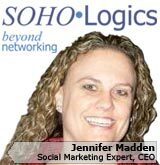 She has specifically been the catalyst of SOHOLogics’ new marketing direction and initiative. The marketing know-how does not stop with SOHOLogics; it is the driving catalyst for our marketing initiative for our clients too. 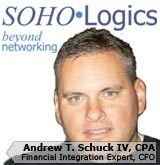 Andrew Schuck joined the brain trust of elite individuals in May of 2002. He has been inspirational in equipping SOHOLogics with the Financial knowledge SOHOLogics needed to combine and propel solutions for its clients onto a whole new playing field. Andrew has worked closely with Jason to ensure each solution and service SOHOLogics offers provide clients with an economical and technological edge over the client’s competition. Andrew also uses his vast array of expertise to ensure every solution fits the client’s budget and means. He always ensures that every solution makes sense to each client’s market direction. Jason Osborne founded what would become a brain trust of elite individuals making up the SOHOLogics team. 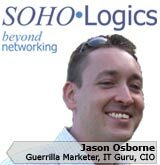 He is the man behind quite a few of the Information Technology and Web innovations SOHOLogics provides to its customers. Jason has been involved in creating solutions for the health care industry, has been involved in the complete IT/Financial fusion project with Andrew Schuck, and helps businesses on a daily basis understand and use technology in their industry to propel their businesses on to a whole new plane those companies would have never imagined. Data and Telecom Network Solutions was original founded in May 2000. It has grown significantly over the past few years allowing it to offer more services to the surrounding commercial and residential communities. When the company was first founded, it only offered basic network installation and web design services to small business customers. Over the past few years, Data and Telecom Network Solutions has begun to offer a wide range of services to not only small business customers but also to medium business and residential customers. In 2002, Data and Telecom Network Solutions decided that it needed to increase name branding and recognition of the company. In order to signify the name based on the company’s core competency to achieve recognition in the community, the name SOHOLogics was born. The name is derived from SOHO meaning “Small Office/Home Office” and Logics meaning a valid or faulty interrelation of a sequence of facts or events that is inevitable or predictable. Data and Telecom Network Solutions sold its client base and assets to SOHOLogics. All current and future customers of SOHOLogics receive the same level of service that Data and Telecom Network Solutions once provided and much much more. The goal of SOHOLogics is to be synonymous with the total technological solution company. We strive to bring the most technologically advanced solutions to your office in a turn-key solution which will propel your business to the next level allowing you to compete and beat the companies of not just today but tomorrow. Our team works tirelessly to ensure that we are the most knowledgeable brain trust in Dallas, the United State and the World. We leverage all aspects of technology to ensure that your business will succeed and grow. Our clients’ growth is what guarentees they not only do extremely well, but that SOHOLogics does too.